It’s that time of the year. Ginger bread cookies seem to be a staple in foreign Christmas celebrations and the tradition is slowly getting to Malta as well. I decided to take a go at them using my own flour alternative; fine ground almonds. 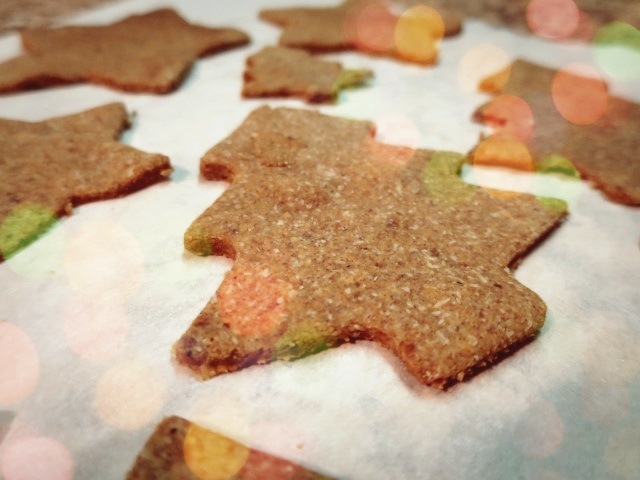 The recipe is quite easy to make and the most time consuming part is cutting out the cookies. These cookies are great if stored at room temperature. They will turn chewy by time because of the dates and honey but I found this to give a nice caramel effect on the palate. If you want harder cookies I suggest cooking them slightly longer while keeping an eye on them so that they don’t burn. If you are looking for more Christmas desserts take a look at my all time favorite Cinnamon Rolls recipe or my Christmas log recipe. You can also make mini Christmas logs or balls instead of a whole log so that you have individual bite size pieces. If you are looking for more party size desserts then check out my Healthy Ferrero Rocher recipe and home-made chocolate bites. Start by blending the dates with the coconut oil until dates are broken into smaller pieces. Add the almond meal and blend/grind until all dates turn to a grits. Pour in the remaining ingredients and blend together with the almond meal mixture. Add the water as needed until a dough ball is formed. Divide the dough into about 4 parts and place on a clean surface. Flatten using rolling pin to almost 3mm thickness. Cut shapes from the dough using cookie cutters and place on a lined baking tray. Repeat the process until all dough is used up. Bake in a preheated oven for about 12 mins. I flipped half way through. This depends on your oven so keep an eye on them. Almond meal is the same as pure ground almonds. You do not need almond flour as finely ground almonds are enough.